I hope you’re sitting down, because today’s post is a doozy. 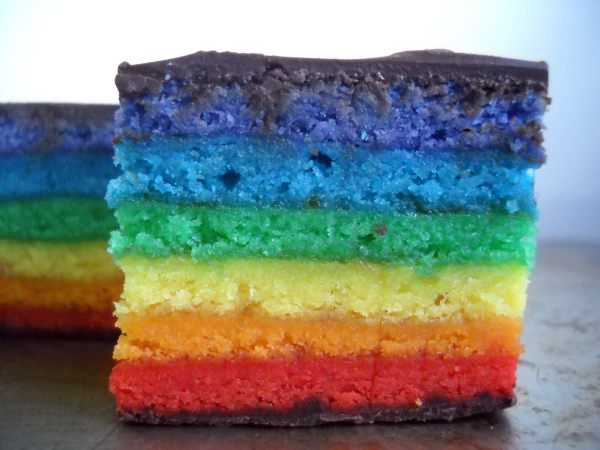 You’re looking at a rainbow cookie—the same almond paste-based, cakey, chocolate-edged treat the young me raced from table to table to snag every Saturday at my shul’s kiddush. 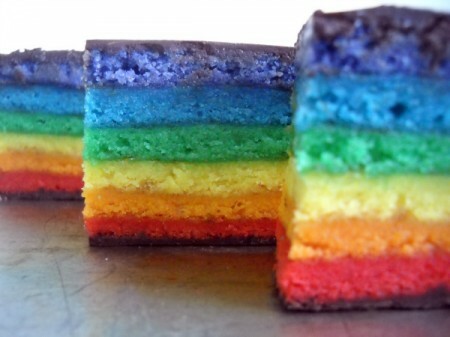 But these are not just any rainbow cookie. Rather than three colors (we Jews tended towards neon green, yellow, and pink, while the traditional Italian version is usually green, white, and red), I went for a true rainbow. Six colors. The most kid-pleasing, grownup-pleasing, lovely to look at cookie you’ll ever encounter. 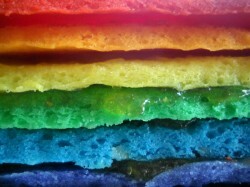 You know I’ll never lie to you, so I’ll just flat-out say it: Making a six-colored rainbow cookie is a bit ridiculous. It calls for a considerable amount of futzing. If you’re not up for greasing and lining six 13 x 9 pans, dividing your dough into six bowls and coloring each individually, spreading them into those six pans and baking two by two, then finding enough counter space to cool them all without your cat devouring a giant hunk of the yellow layer, then by all means go for the three-colored version. Nobody will ever know you took the easy way. See that huge gouge? I nearly shipped Samuel kitty off to military school for that one. And that really is the easy way—I knew I’d be complicating the coloring and baking process, so I streamlined the recipe itself. While most versions call for whipping the egg whites separately, dirtying an extra bowl (and stressing me out about whether or not I’ve reached the “soft peak” stage), mine adds whole eggs and then just beats the heck out of the dough. If you’re only making three colors, the mixing and baking portion of the recipe will take barely 45 minutes, after which you can take a break while they cool, then stack and refrigerate for several hours or even overnight before coating with chocolate. See: easy! And a truly Nap-Friendly Recipe. Along with a junk-food-amped version of The Best Homemade Chocolate Chip Cookies in the Entire World (recipe coming soon for that one! ), these beauties are going out to still more of my holiday-gift list. Properly packed, they stay fresh for quite a while, so they’re perfect for shipping. Heat oven to 350°. Grease and flour six 13″ x 9″ baking pans (I supplemented the two I own with four disposable ones) and line with parchment paper; set aside. In the bowl of a stand mixer fitted with the paddle attachment, beat butter, sugar, and salt on medium until pale and very fluffy, about 2 minutes. Add the almond paste and increase speed a notch or two; beat until smooth. Add the eggs one at a time, beating well after each addition, and then the extract; beat 2 more minutes. Add the flour (cover the mixer with a damp kitchen towel to keep it from clouding your entire kitchen); beat on low until just combined. Evenly divide batter into 6 bowls (I find it easiest to do this with a one-cup measure, putting one cup of batter into each bowl, then a second, etc). 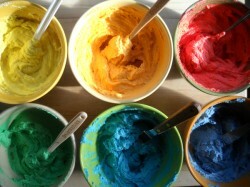 Add violet food coloring to one bowl, blue to the second bowl, and so on down the rainbow; stir colorings into batters. 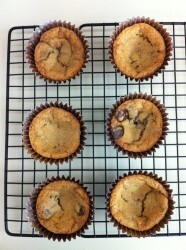 Using an offset spatula, spread the first 2 batters into a prepared baking pan. 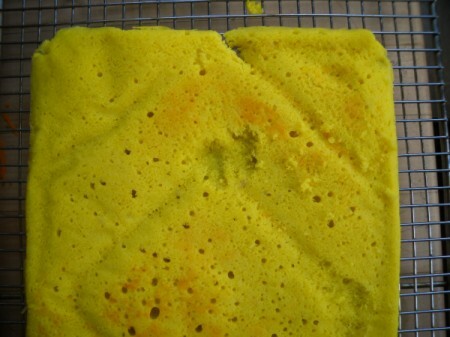 It will be a thin layer—don’t stress about making the edges and corners perfect, but do fill the pan. Bake those 2 pans until just beginning to brown, 8 to 10 minutes. If your oven bakes unevenly, rotate the pans halfway through. 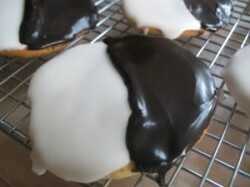 While the first 2 colors are baking, spread the next pair into pans. While the second 2 are baking, spread the final pair. Allow cakes to sit in the pan for a minute or two, then invert onto wire racks; cool. The cakes will feel fairly delicate at first, but once completely cool they’ll be quite sturdy. Heat jam in a small saucepan or the microwave and stir until smooth; cool slightly. Place purple cake on a cutting board or foil-lined baking sheet. Using an offset spatula, spread 1/4 cup of jam over it in a thin layer (seriously, I mean thin: too much and the layers will slosh around); top with blue cake. Spread 1/4 cup of jam over blue cake; top with green cake. Repeat with yellow, orange, and red layers, leaving the top of the red layer bare. Cover the stacked cake with waxed paper and place a baking sheet on top. Weight it down with cans and refrigerate at least 4 hours, or overnight. Melt half the chocolate with 1 teaspoon of olive oil and stir until smooth. Remove the cans, pan, and waxed paper from the cake stack (save the waxed paper—you’ll need it later). Using an offset spatula, spread the chocolate over the top. Refrigerate for 20 minutes, to set the chocolate. Melt the remaining chocolate and olive oil together, and remove the chilled cake. Cover with waxed paper, place the baking sheet on top, and carefully invert the entire thing. Uncover and spread the chocolate over the top. Refrigerate again for at least 1 hour, uncovered, until chocolate is completely set. With a large, sharp knife, trim edges so everything is aligned nicely—if your chocolate looks like it might crack, dip the knife into a glass of hot water and wipe it dry before each cut. Cut the cake crosswise into 8 strips, then cut each strip into 6 pieces. Store tightly packed in airtight containers, and they should stay fresh for at least two weeks. MAKE BABY FOOD: If there are no nut allergies in your immediate family these are safe for babies on finger food, but given the sugar content I’d save this for special occasions only—which, considering how much effort they require, is probably the only times you’ll make them anyway. A NOTE ABOUT FOOD COLORING: Obviously, this recipe can’t be made without some sort of dye. There are natural, food-based colorings on the market, but in my experience they don’t provide the vivid colors I wanted here. Generally speaking, I only bust out my gel paste coloring for special occasions, and considering how much of a potchke these cookies are, they definitely qualify. That said, if your child is sensitive to food dyes, use the natural versions! You are seriously a rockstar to even do this. I would never have the patience. I could eat them though. Easily. Your cookie recipe is now being passed all over Pinterest! WOOHOO! Thanks for this. How cool, Alli! Thanks so much! No thank YOU!!! I’ll be back! Keep making awesome stuff, lady! I never thought these could be made at home! I am impressed. Yum! 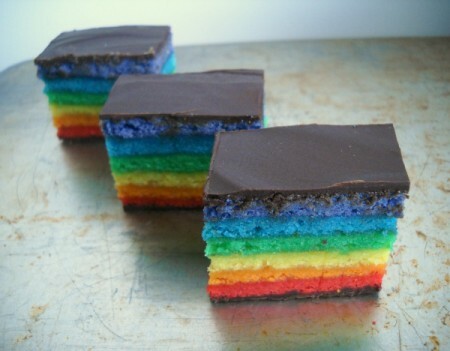 I have made a rainbow cake with 6 layers and rainbow cupcakes and even did a tie dye cake this past weekend but I have yet to try rainbow cookies. Not for long……! A tie-dye cake sounds amazing! Well done for making these! LOVE the colors! I grew up eating them in NY. Your gift receivers are very lucky indeed. I keep coming back and thinking if I’m really up to this challenge. Could you send me out a sample? You know just to check. Dude. I wish someone would send *me* some samples at this point. They were mighty tasty, but I ain’t making them again myself until next year! 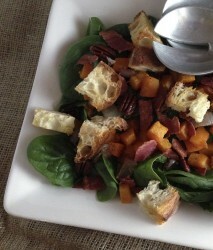 My kingdom for a gluten-free version of this recipe!! Tamara, I’ll bet this would work just fine with one of the GF flour substitutes. Or is there some other gluten-containing ingredient? I admit, I’m not fully up on GF issues. Oh, no no no…I have your cookbook, I love your blog, so please know I’m coming from a good place. But, artificial colors are a nightmare for kids’ (and adults’)health. I cannot get behind this. Please do not encourage people to feed this to their children. Hi Bree. Thanks for leaving such a civil comment! I’m comfortable with my son having an occasional treat that uses food coloring–especially when I’m in control of how much goes in. I never buy foods with coloring added and rarely do things like this at home, so it’s ok in my book. We all get to decide what works for our own families! I’d never presume to judge the choices someone else makes, since I don’t know the specifics of their situation. Have you considered using natural food dyes? They’re pricey and the colors aren’t as rich–which is why I don’t bother, considering how infrequently I use them–but completely plant-based.